If you are looking for a security guard agency to supply you with security services, we can offer you a smilar service as security guard agencies but for similar costing but a better service, agencies may only supply security personnel, not only do we supply security personnel, we also supply our management service, your requirements are made into a set of protocols, this handbook is given to all staff, we can supply security staff on a short or long term basis often at short notice. We have security signage that we can place around your site if required, our service comes complete with any equipment needed, such as metal detectors, log books, incident reports, flashlight, patrol monitoring systems. 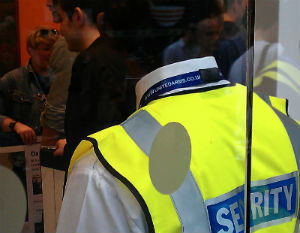 All our security guards are uniformed, we have a security wardrobe where you can choose the uniform that your security will wear, we have traditional suits, security bomber jackets, three quarter jackets and hi-visibility jackets and vest. All our security guards are clean shaven and well presented, they hold SIA licences as required by law, and we have our own insurances. © 2012 unitedarmssecurity. All rights reserved.